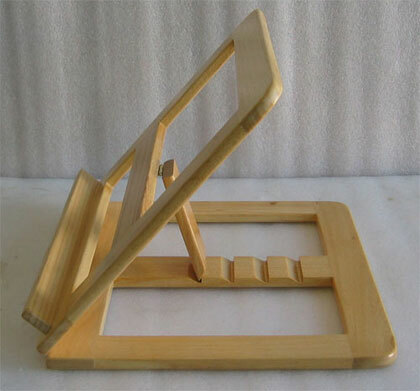 Item shown above : Book Holder in Natural finish. Book holder provides comfortable, hands-free reading and ergonomic multi-positioning for individual satisfaction. Avid readers, rehab patients, business professionals, students and the physically disabled are among the many finding these articulating ergonomic accessories so useful. Easily adjust the height and angles to fit your comfort, freeing your hands for sipping coffee or simply relaxing! Made from solid wood. No assembly required.